Select Plumbing & Heating repairs and installs grease traps, large and small. Whether you have a leaking grease trap and need it replaced, or you require a new grease trap installed, we have the experience to ensure the job gets done properly. Every kitchen sinks in the world whether in a home kitchen or a restaurant kitchen discharge a huge amount of grease with waste water. This makes it very important to have grease traps installed so that the waste is intercepted before it gets to the drainage and sewer systems. Failing to do so would prove to be an expensive affair to the people concerned. Moreover, it would become difficult to handle local authorities if you are in Etobicoke when they get to know how your waste material is hampering the city as a whole. However, you need not worry as Select Plumbing and Heating is there to take care of the issue. 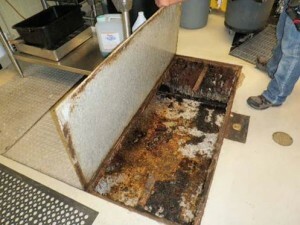 We are here to do our best to get this problem resolved in the quickest way possible by installing grease traps. To everybody in Etobicoke we would suggest you to get in touch with us to install grease traps on your property as soon as possible since we are just a phone call away. The longer you take, the nastier the problem would become which would result in more expenses and stress for you. Our services are also available in places like Mississauga, Oakville, Brampton, etc. Call Select Plumbing and Heating now at 1 888 501 5501 or 905 501 5501 to find out the best solution for your kitchen sink grease related problem. Install grease traps and enjoy its benefits.